The charter of the World Trade Organization (WTO) sets the tone that sustainable trade and economic development dominates multilateral trade negotiation and specific working agreements. This book examines the novel challenge for developing countries to upgrade and optimize their industrial structure and trade composition by stimulating genuinely innovative and competitive industrial strength. 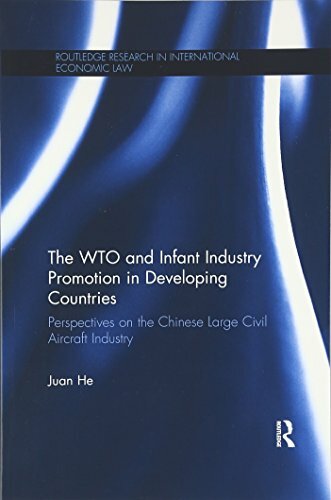 The book specifically explores the issue of infant industry promotion under the legal framework of the WTO treaties and case law. Taking the regulatory measures and incentives China has used to build up a large civil aircraft supplier, the book evaluates the key trade agreements relevant to infant industry promotional policies and practices, such as product regulations and standards under the 'Agreement on Technical Barriers to Trade', and export promotion policies under the 'Agreement on Subsidies and Countervailing Measures'. Juan He argues that the regulatory room prescribed by the multilateral trade rules of the WTO does not allow adequate space for developing countries to encourage new and technologically advanced areas of production and trade. The author concludes by suggesting ways in which WTO rules could be modified to help enable developing countriesÃ¢ÂÂ industrialization. In doing so, the book highlights a need to investigate how localized and international policy trends can be reconciled and enhanced towards the common goal of development. The book will be of great interest to scholars and students of international trade law, Chinese studies, international political economy, and of great use to government agencies responsible for internal trade and industrial policy decisions. About: The charter of the World Trade Organization (WTO) sets the tone that sustainable trade and economic development dominates multilateral trade negotiation and specific working agreements.